SAN JOSE, Calif.--(BUSINESS WIRE)--Sep. 17, 2018-- Cypress Semiconductor Corp. (NASDAQ: CY), the embedded solutions leader, today introduced a Bluetooth® audio offering that brings leading-edge performance to wireless earbuds and hearables. 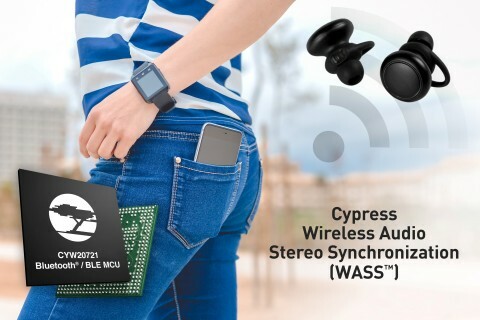 Based on the new Wireless Audio Stereo Synchronization (WASS™) application and the CYW20721 Bluetooth and Bluetooth Low Energy (BLE) Audio microcontroller (MCU), the solution provides robust connections for differentiated performance in wireless earbuds. The MCU features a link budget that is 6 dB better than competing chips, resulting in up to twice the range. The extended range and the WASS application combine to enable superior cross-body performance, giving users uninterrupted audio on their earbuds with their smart device in their back-pocket or on their wrist. The MCU also operates at nearly 50% lower power consumption than competing chips, enabling twice the playback time or the use of smaller batteries in sleeker form-factors. The novel WASS application is available in Cypress’ WICED® Pro software development kit (SDK), the latest version of its all-inclusive WICED SDK that provides developers with a turnkey solution to get products to market quickly. The highly-integrated CYW20721 chip employs WASS software that leverages 15 years of innovation and development experience with headsets, mobile devices and virtual reality products. The multi-mode Bluetooth/BLE MCU also includes essential consumer features such as voice commands and cloud-based voice services. Cypress’ WICED Pro development platform supports an ecosystem that includes multiple audio codec partners, allowing for price and performance differentiation, including echo and noise cancellation. The WASS software further benefits from advanced wireless error correction algorithms in WICED Pro, offering high-fidelity connections. More information on Cypress’ wireless solutions can be found at www.cypress.com/wireless. The Wireless Internet Connectivity for Embedded Devices (WICED) SDK enables cloud connectivity in minutes with its robust libraries that uniquely integrate popular cloud services such as Amazon Web Services, IBM Bluemix, Alibaba Cloud, and Microsoft Azure, along with services from private cloud partners. The WICED SDK also supports iCloud remote access for Wi-Fi-based accessories that support Apple® HomeKit™, which enables hub-independent platforms that connect directly to Siri voice control and the Apple Home app remotely. More information on Cypress’ WICED SDK, ecosystem and community is available at http://www.cypress.com/wicedcommunity. Cypress, the Cypress logo and WICED are registered trademarks and WASS is a trademark of Cypress Semiconductor Corp. All other trademarks are property of their owners.